Evil Hackers are lurking everywhere and many Web-applications are delicately and share “too much” with the attacker. A quick (first!) 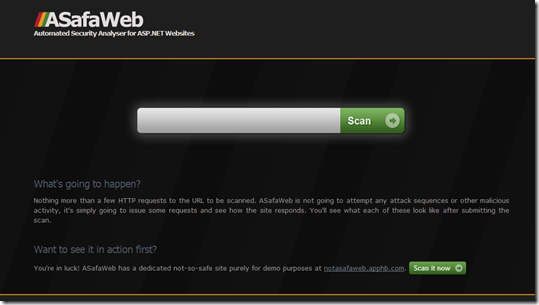 overview offers the Tool “ASafaWeb”. All the website does is making a few requests and writing an Analyses including problem solving’s. There are no permanent disadvantages (bad requests/ DoS attacks and so on). 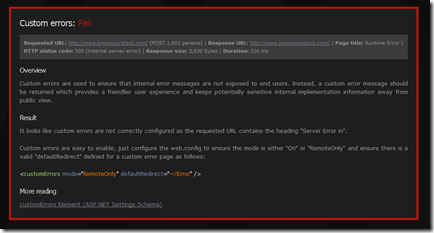 The last test recommends hiding the information’s about the ASP.NET version / IIS. The service only provides very simple tests – For example there is no test for the entering validation. Here you need to be very carefully! Prevent the Top 10 Security holes! Some time ago Philip Proplesch referred about the excellent Blog row from Troy Hunt: OWASP Top 10 for .NET developer’s part 1: Injection. Read!